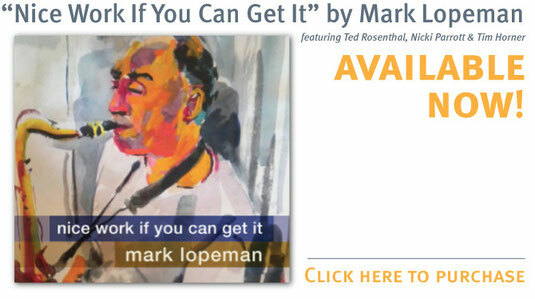 Mark Lopeman's debut album features mainstream jazz performed by top contemporary New York musicians in quartet and sextet settings, arrangements and compositions by Lopeman. Featuring Ted Rosenthal, Tim Horner, Nicki Parrott, Brandon Lee and Noah Bless. It's fitting that the cover of saxophonist Mark Lopeman's latest album, Nice Work If You Can Get It, is a watercolor portrait from his daughter Rosie. After all, Lopeman approaches his instrument like a painter himself, utterly spellbinding in his ability to illustrate various moods from the unbridled joy of “My Reverie" to the warm caress of “I'm a Fool to Want You" to the gentle introspection of “Everything Happens to Me." Stellar musicians such as the New York-based Lopeman aren't simply born; they are made, creatively evolving as the years pass.